Fall has never been a season that inspired my decorative side. . . until now. 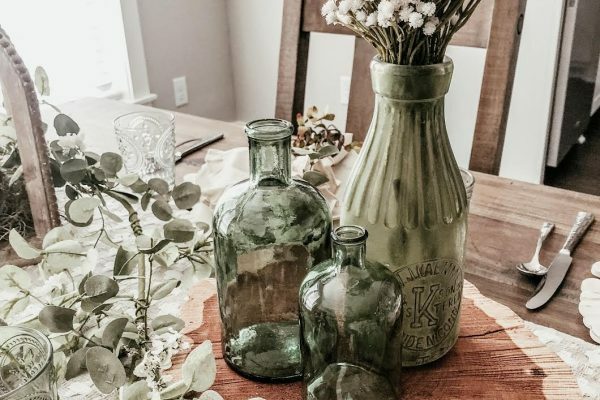 Turned off by the traditional oranges, reds, and browns–the usual color scheme of fall decor–I decided to move in a new direction for my home. 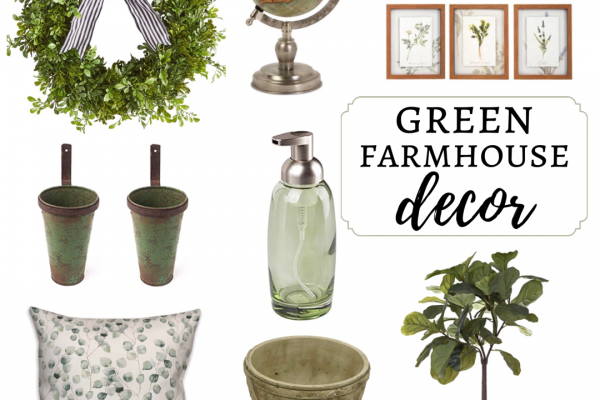 Muted blues, greens and grays have become my new color go-to’s. 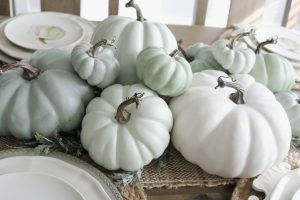 Using faux pumpkins I can paint the shades I want to see, I am able to give my home the beautiful fall look that I have longed for. 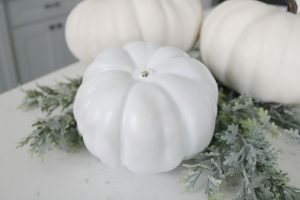 Here is how I transformed these faux pumpkins in 4 easy steps. The entire project took me about 1 1/2 hours. This will all depend on how many pumpkins you want to paint. Tip: I found all of these materials at Hobby Lobby and if you go on the right week, you can score all the pumpkins at 40 or 50% off. The paints, primer, sealant, and brushes are all even on the same aisle! First remove all of the stems. Next, prime all of the pumpkins by spray painting them, preferably outdoors and allow them to fully dry for at least an hour. I used Krylon Paint + Primer in white, so I only needed one coat. 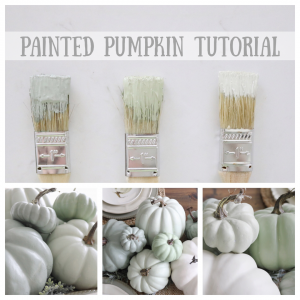 Once the pumpkins are dry, begin mixing your paint combinations until you achieve your desired colors. For my pumpkins, I used a few different brands and mixed them to make 3 combinations. 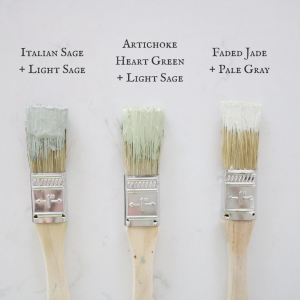 Italian Sage by FolkArt is my favorite go-to acrylic paint color that I’ve used for multiple projects. 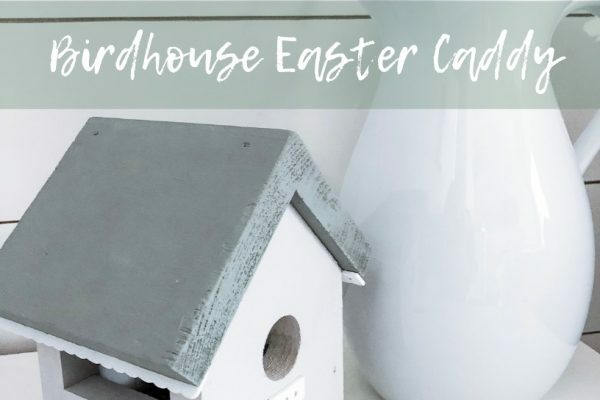 The other colors I used were Light Sage, Artichoke Heart Green, Pale Gray & Faded Jade. 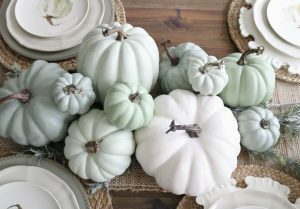 I didn’t want any pumpkin to look “too green” so I mixed each green paint with a lighter green or a gray to achieve the muted look I wanted. Apply one coat of paint to each pumpkin and allow 20 minutes to dry before applying the second coat. Tip: Use wax paper to lay them on to reduce taking paint off when you pick them back up. Last, brush on the matte interior/exterior varnish. Once the sealant is dry, the stems can be pushed back into the pumpkins. Hot glue underneath each stem for extra reinforcement. You’re all done! 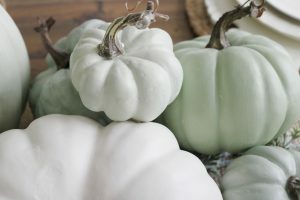 This project is super simple, and the best part is, unlike real pumpkins that you throw out at the end of the season, these pumpkins last forever! Sweet! Thanks for sharing! 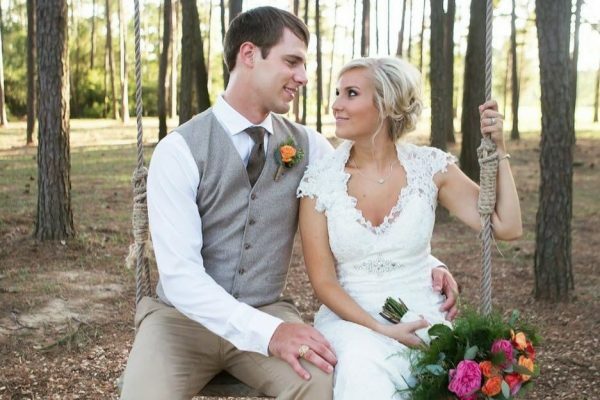 😃I love the pictures! 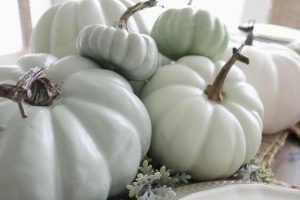 I love the muted colors of these pumpkins!! I just found out why my painted punkins didn’t turn out lookinking like yours. Thanks so much. I am going to redo them.